The Microx 4 is a completely stand-alone, portable fiber optic oxygen meter. 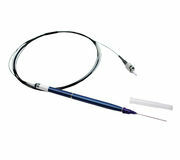 It can be used with non-invasive sensors & probes (1 mm fiber), and oxygen microsensors (200 µm fiber) in different designs. This oxygen meter is compatible with the wide range of sensors type PSt7 (detection limit 15 ppb, 0 – 100 % oxygen). With its integrated barcode reader the Microx 4 can easily recognize and assign calibration data to sensors in just one scan. The implemented sensor management system allows storing data of up to 100 sensors. Microx 4 has 16 GB internal memory which allows prolonged computer-independent operation. 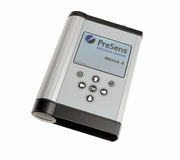 It is delivered with the PreSens Datamanager software: sensor, user and measurement data is easily transferred between the PC and the oxygen meter. The data management and easy data export will facilitate and speed up your analysis. The PM-PSt7 is one of the most robust oxygen microsensor PreSens offers – with a firmer fiber construction and a splash-proof metal housing. It is specifically designed for profiling applications and should be used whenever minimal invasive measurements need to be performed in semi-solid samples, e. g. in sediments, microbial mats or biofilms. The PM-PSt7 is compatible with the Microx 4 series oxygen meters and has a measurement range of 0 – 100 % oxygen, with a detection limit of 0.03 % oxygen. 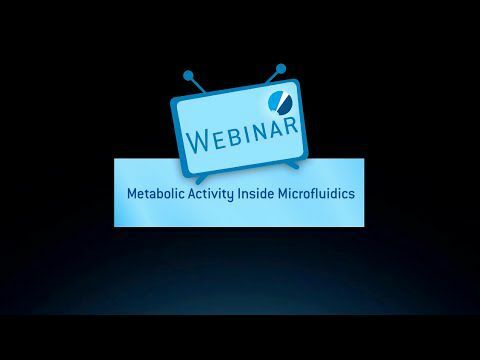 Together with the Automated Micromanipulator and the software PreSens Profiling Studio boundary layers and gradients can be followed online, while the sensor is automatically moved inside the sample. 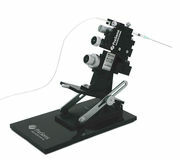 The Manual Micromanipulator MM is specifically designed for PreSens needle-type microsensors (NTH). The system allows moving the microsensor vibration-free in 3 axes with µm reading accuracy. A solid base plate ensures a stable set-up of the micromanipulator and enables safely tilting the whole system up to 90° - so you can use it in any required position. With the safe-insert function the microsensor retracted in its steel needle can be securely inserted into your area of interest. The sensor tip can then be extended delicately and safely with µm reading accuracy, without risk of breaking the sensor fiber.